Our final month and a half of deputation found us back in Texas! We so enjoyed each pastor and flock! We are blessed to have two new supporters: Northside Independent Baptist Church in Fort Stockton and East River Baptist Church in New Caney. A very special THANK YOU to Faith Baptist Church in Temple. It was at this church we had our last scheduled meeting in Texas. We got in the car at the hotel, and it would not start! This is the FIRST time that something like this has happened! Fortunately, God had another missionary staying at the same hotel that could give us a ride to church. 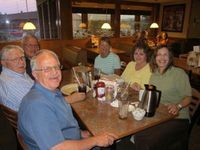 The next morning, Faith Baptist took care of the towing and the replacement of a fuel pump for us, and as the repairs took all day, they paid for our extra night in the hotel. God and his folks are so very good to us! Thank you, Pastor Mike Lewis! Our last meeting will be a mission conference here in Greenville at Bethel Calvary Baptist Church, August 19-22. The greatest blessing I have heard from the field was……. Due to the one day delay, we decided to drive straight to our kids in Greenville, via a stop for dinner in Madisonville, LA with some very dear friends, Tommy and Ka’Saundra Brownfield. I had planned to accompany Ben to a wedding, so after arriving at 5 am, I cleaned up and he and I took off for a four hour drive! It was a fun time of fellowship – and I am glad he could do the driving! Although we have much to accomplish during these few remaining weeks, we are spending time on purpose together. The kids have chosen a variety of “holidays” to celebrate while we are here. I think they want to be sure and get in the favorite meals their mom makes before she departs! Our oldest son Jesse, and his wife Katie will be visiting next weekend, and we are looking forward to seeing them. 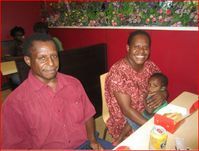 Pastor Jerry Miri my co-worker and wife (Avoro) and son (Lakobob) CAN’T WAIT TO SEE THEM! We have begun the task of emptying the car, looking at what we have had sent ahead to our kids here, and making lists. How does one actually pack five years of stuff into 4 fifty-pound suitcases? It is amazing how fast such a big looking space can fill up! Just keep us in prayer, that we will bring exactly what we need to bring! Lord willing, we will arrive in Port Moresby, PNG on September 1. Those first few days will be a whirlwind, getting a bank account, driver’s license, and several months of supplies – especially while our “sleep” is upside down. We are excited about news we hear from Papua New Guinea! The guesthouse in Kotidanga, where we first will stay, is progressing wonderfully. We will be there for at least a couple months, and are looking forward to going through a newly developed orientation course and studying Tok Pisin (Pidgin). There is also a Pastor-Missionary Fellowship my second week in the country, so I will have an opportunity to attend and meet many of God’s PNG workers! Brother Jerry Miri, my national co-worker, has begun preparing and gathering supplies for his home on our land in Ihu – and it sounds like that home will include a guest room for us! This will be a big help to me while I am preparing our place to live. The greatest blessing I have heard from the field was of the Orokolo man won just this week to the Lord! While Jerry and Murphy (another young pastor in the area) were getting cooking supplies to feed the men helping Jerry build, they got to bring a soul to the Saviour! They say he is very interested in the things of the Lord and they have already begun a discipleship study with him! I am thrilled to hear God is answering our prayers among the Orokolo and for the opportunity to help pioneer this exciting work. *** Profitable, safe days in Port Moresby upon our arrival. Wisdom in shopping for supplies and God’s help in finding what we need. *** God’s help in learning Pidgin and great patience for those assisting us and listening to us! ***Adjustment to the separation from family members, (for us going and those staying), and the feeling of isolation that will occur, especially upon moving to Ihu. ***Good weather for traveling: to Kotidanga, to Ihu, and to the preacher’s fellowship in Wau – and God’s blessing on that meeting!